Everyone has probably heard the stories of when a cat nurses Chihuahua puppies or about similar cross-species caregivers. You may even have heard the story about the one-hour-old baby Chihuahua that was brought to the Phoenix animal shelter called Halo Animal Rescue. The puppy's mother died during childbirth, orphaning the little guy. Amazingly, a nursing cat at the shelter took the pup into her litter and nursed him. How Did Rescuers Get the Cat to Accept the Puppy? The black cat had kittens about the same age as Liam, the puppy. Workers simply slipped the pup in with the cat's newborn nursing kittens and waited to see what would happen. The mother cat didn't bat an eyelash and seemed to accept Liam as though he were one of her own. This isn't the first time this sort of event has happened, of course. There are many examples of animals nursing orphaned animals from another mother. There are even examples of a mother cat, having lost her own kittens to death, that takes other kittens or pups as though they were her babies. Tinkerbell Nurses Whole Litter of Chihuahua Puppies: This owner videotapes and explains how her cat, Tinkerbell, takes on an entire litter of Chihuahua puppies in addition to her own kittens. Dog Nurses Kitten: In addition to cats nursing Chihuahuas and other dogs, dogs can also nurse kittens as shown in this video. Cat Kidnaps Puppies: When a dog who shares the same owner as this cat doesn't take care of her puppies, the maternal instinct kicks in and this yellow cat carries off the puppies, nurses and grooms them. Kitten Nursing Dog: This kitten and dog completely smash through the age-old myth that dogs and cats are each other's enemies. These two animals seem to be close friends. 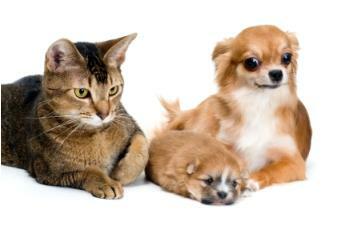 There's not much impact on a normal-sized adult cat that nurses a couple of extra Chihuahua puppies. However, the size of the cat and the size of the puppies should be considered when you're trying to decide whether or not to foster a newborn. A larger dog, especially if the cat is nursing several pups, may quickly demand more milk than the cat is able to produce and still remain healthy. If your cat is nursing dogs or kittens that are not from her own litter, it is probably best to consult with your veterinarian and make sure she is not at risk and able to produce enough milk to feed her own kittens plus the extras. Also, get details on how long she should nurse the pups, when they can begin to eat on their own or if it would be better to switch them to puppy formula after a few weeks. It is not at all unusual for a mother to adopt babies in the wild, even animals of another species. There is nothing quite so heartwarming as a cat accepting a dog into her own feline family and treating him as though he were one of her own.